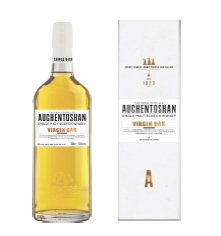 August 2013: Auchentoshan, Scotland’s only triple distilled Single Malt Scotch Whisky, is launching an exclusive limited edition - Auchentoshan Virgin Oak. This complex, non-chill filtered dram is Auchentoshan’s first ever single malt to be solely matured in virgin North American oak casks, wood that is previously untouched by any spirit. Intuition and industry knowledge led the team at Auchentoshan to believe they could challenge the firmly entrenched belief that Scotch whisky must be matured in ex-bourbon or sherry casks. Since the millennium, Auchentoshan has placed small batches of the unique, triple distilled spirit in virgin North American oak whose charred surfaces have held neither bourbon nor sherry. Time and patience revealed the whisky, which had spent its maturation in this virgin oak, to possess a deep orange colour with spiced apple and candied notes as well as layer upon layer of complexity. Established in 1823, Auchentoshan triple distils every drop meaning the spirit produced reaches 81.5% ABV, significantly higher than most distilleries in Scotland. It is this smooth distillate paired with the carefully selected oak casks that gives Auchentoshan an unmistakably light and fruity flavour. Auchentoshan’s inventive approach to whisky production has led the brand to embrace innovative ideas and processes such as maturing whisky in virgin oak. Boasting the same classically modern livery as a number of its Auchentoshan Limited Edition peers, the Auchentoshan Virgin Oak packaging is refined yet impactful. The contemporary typography is bright white against the classic grey background of the carton and gives the pack a premium contemporary feel. One that reflects Auchentoshan’s classically modern approach. To the eye: Sienna orange. To the tongue: Spiced apple, smooth chocolate caramel, maple candy and a velvety mouth feel. The finish: Warm with spiced orange and brown sugar.